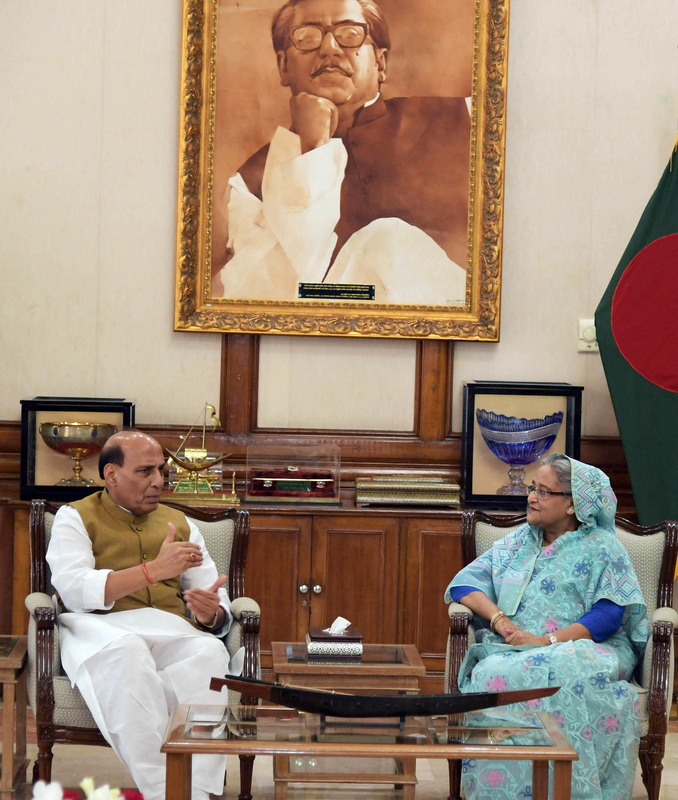 The Union Home Minister, Shri Rajnath Singh calling on the Prime Minister of Bangladesh, Ms. Sheikh Hasina, in Dhaka, Bangladesh on July 14, 2018. The Union Home Minister Shri Rajnath Singh called on the Prime Minister of Bangladesh, Ms. Sheikh Hasina in Dhaka today. The meeting took place in a cordial and friendly atmosphere in the presence of senior officials from both sides. The Home Minister conveyed the greetings of Prime Minister Shri Narendra Modi to Prime Minister Ms. Sheikh Hasina. The Home Minister complimented the Prime Minister for the excellent growth registered by Bangladesh’s economy under her leadership with a growth rate of 7.78% last year. The two leaders noted that much has been achieved by India and Bangladesh by working together to counter the menace of terrorism and radicalization. They agreed that all countries in the region that are afflicted by this menace should proactively join hands to effectively tackle it. The Home Minister also thanked the Prime Minister for the cooperation extended by Bangladesh in addressing India’s security concerns. They also discussed the influx of displaced persons from the Rakhine State of Myanmar over the past year. The Home Minister conveyed that India is committed to helping in the safe, speedy and sustainable return of these persons to their homes. In this context, India is working on a project to construct prefabricated housing in Rakhine State so as to meet the needs of the displaced persons. India will also continue to provide relief material and supplies to help Government of Bangladesh deal with the needs of those in the relief camps. 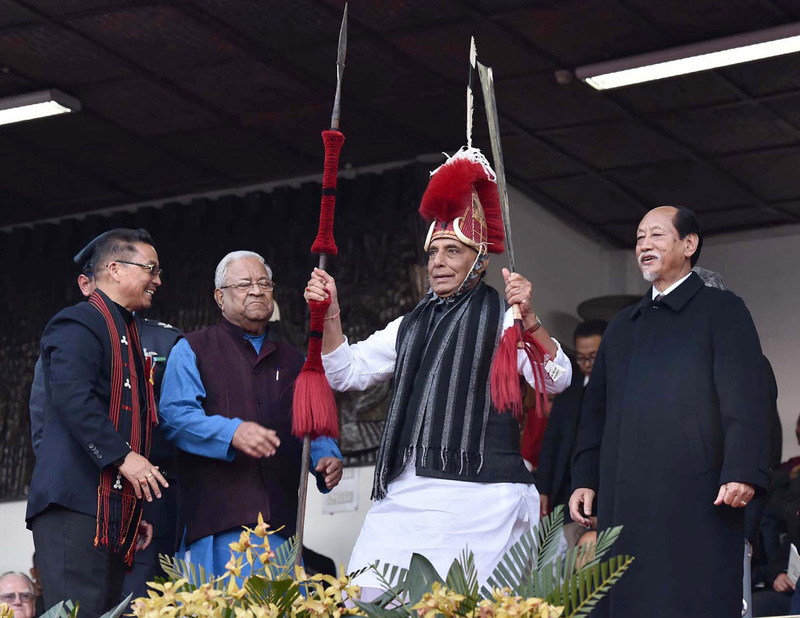 During his visit to Rajshahi in western Bangladesh, Shri Rajnath Singh and the Home Minister of Bangladesh, Mr. Asaduzzaman Khan jointly inaugurated the Bangladesh-India Friendship Building at the Bangladesh Police Academy, Sardah, foundation stone of which was laid in 2015 by the Prime Minister of India, Shri Narendra Modi and the Prime Minister of Bangladesh, Ms. Sheikh Hasina. This is a development cooperation project between India and Bangladesh. The newly inaugurated facility incorporates state-of-the-art Forensic Laboratories, Mock Crime Scenes, Mock Police Station, IT Centre with computer labs etc. A Memorandum of Cooperation was also signed between Sardar Vallabhbhai Patel National Police Academy, Hyderabad and the Bangladesh Police Academy, Sardah, Rajshahi to establish mutual cooperation in the sphere of training, management and exchange of trainers and trainees between two Police Academies. The Memorandum of Cooperation was signed by Smt. D R Doley Barman, Director, Sardar Vallabhbhai Patel National Police Academy, Hyderabad and Mr. Md. Nazibur Rahman, Addl (IGP), Principal, Bangladesh Police Academy. This will add yet another dimension to the capacity building programmes being organized in India for Bangladesh officials.